This stitch forms a stable, sturdy fabric that combines the appearance of and favourable properties stocking (stockinette) stitch and 1 x 1 rib. We’ve used it in our Cauldhame scarf pattern. 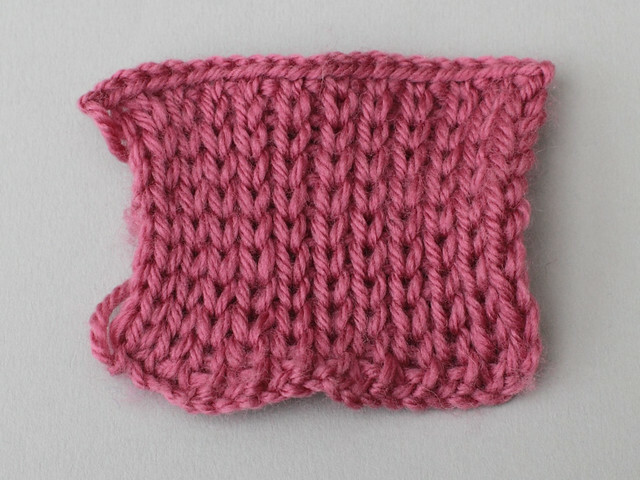 Unlike stocking stitch, it does not curl in either direction and provides a structured edge; unlike rib, it’s horizontally stable and doesn’t stretch out of shape. It is not reversible but looks acceptable on both sides. I prefer the look of the side that has the knit stitches slipped so I’m going to refer to that as the right side. This stitch is often used for button bands on commercial knitwear, but for reasons I cannot explain doesn’t seem to appear in hand-knitting. 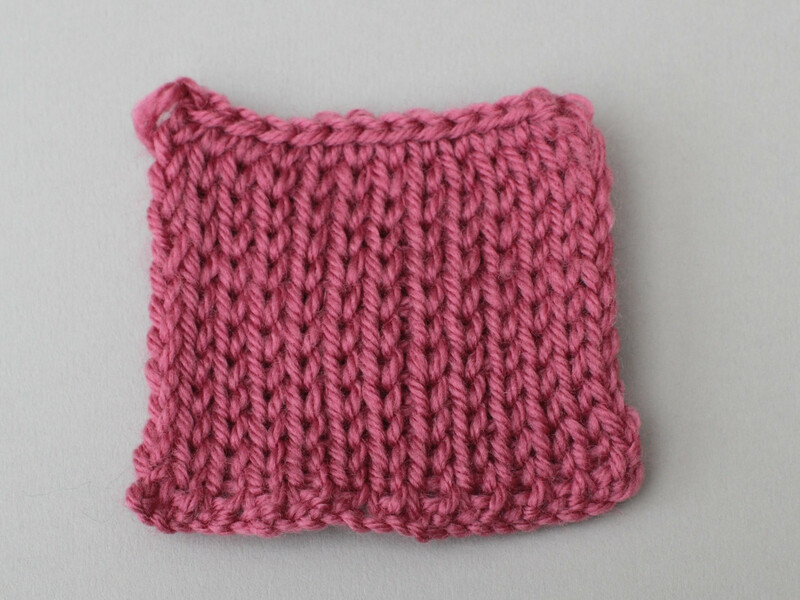 I can’t find this incredibly useful stitch in any of my books or any mention of it online so I’m publishing instructions. I’m calling it 1×1 slipped rib for want of another name, but if you know what it is actually called, please say! 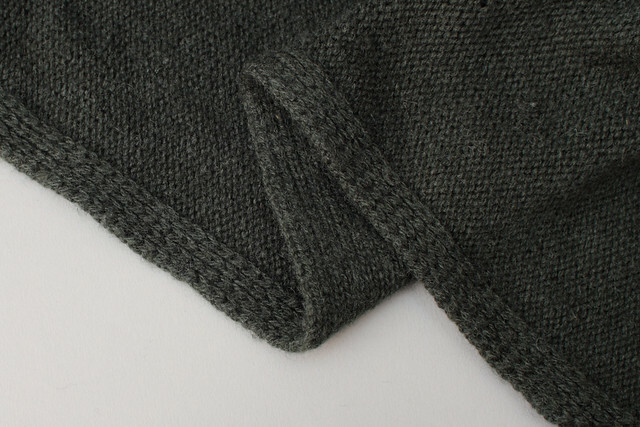 Applied 1×1 slipped rib on a commercially knit garment. 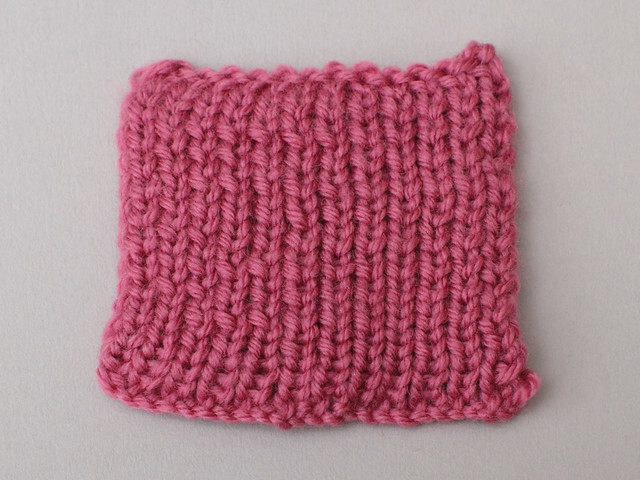 Here it’s used the opposite way to my example, with the elongated slipped knit stitches on the reverse. In the flat, the stitch can be worked in two ways. The results are identical so choose whichever works best for for your knitting style or application. Can be worked with any even number of stitches at each edge, this example uses 6 sts. With 1×1 slipped rib the columns of stitches sit closer together than stocking stitch. 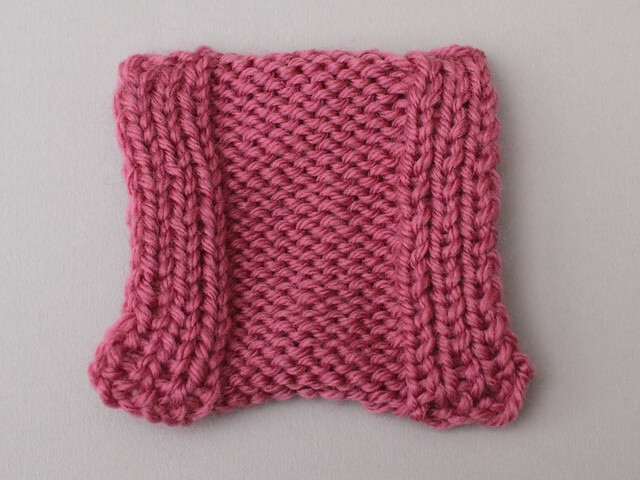 A regular cast off (bind off) gives an edge that’s too long. This doesn’t matter if the number of slipped rib stitches is small (e.g. an applied edging), but across a larger number of stitches this will cause the fabric to pucker. 1×1 slipped rib swatch with regular cast off (bind off). 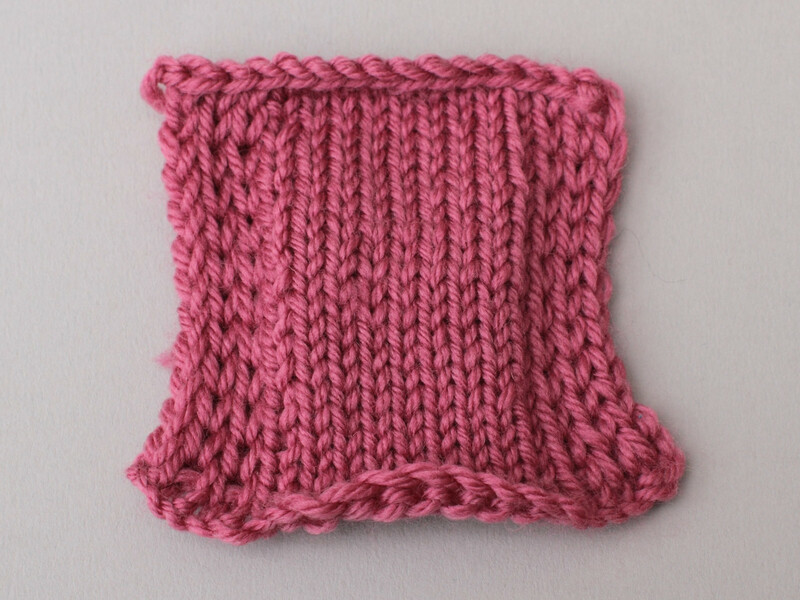 The cast off causes the swatch to stretch out at the top edge. I worked a standard knitted cast on on all swatches, which didn’t case the same level of puckering as the cast off so I made no adjustments. Aside: I didn’t block any of my swatches, they’re straight off the needles. In the applied edging swatch it’s the stocking stitch that’s mostly responsible for the puckering at the lower edge. If you want the slipped rib cast on edge to sit really nice and tight, you could instead cast on half the number of stitches you require (or (n-1)/2 + 1 if you need an odd number), and work a set up row working kfb in every stitch (or k1, [kfb] to end if an odd number of stitches is required). I recommend experimenting to get the right tension and appearance over your cast on and cast off as this will depend how you’re using 1×1 slipped rib in your project. It’s not just me then! Whatever it’s called, I can’t believe this stitch doesn’t appear in stitch dictionaries etc, it’s so useful! In machine knitting it is referred to as a Half Milano inside stitch. It is often used to finish a panel edge, for a slit opening. Thanks Wendy – mystery solved!